I love winter in New York, cold and snowy. For me, there is nothing like a nice hearty soup to warm you up inside on these cold winter nights. 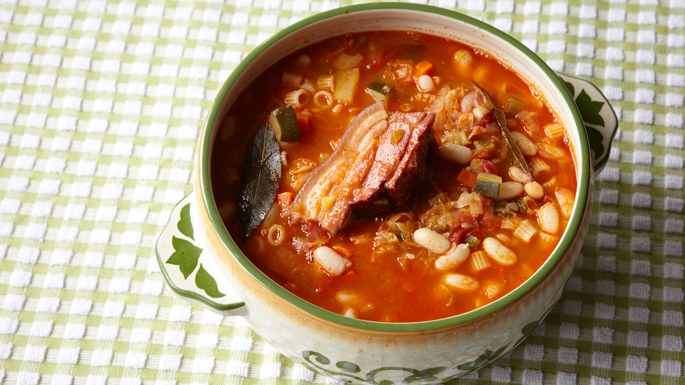 One of my favorites is a good Italian minestrone. I usually make mine with pork, but for a lighter soup I also like it vegetarian. This is a real go-to soup for me – summer and winter. Though this recipe is made with zucchini, potatoes and green cabbage, you can make it with almost any vegetables. Fast-soak the dried beans: place the beans in a large saucepan of cold water. Bring to a boil, add the smoked pork if using, cover the pot and remove it from the heat. Let stand one hour. Heat 3 tablespoons olive oil in a large heavy pot over medium heat. Add the onions, season them lightly with salt, and cook, stirring occasionally, until wilted, about 4 minutes. Add the garlic and continue cooking until the onion is golden, about 5 minutes. Use your hands to remove the seeds from the tomatoes and coarsely crush the tomatoes. Add the crushed tomatoes and their liquid, the red pepper and bay leaves to the pot and bring to a boil. Add the potatoes, carrots and celery, bring to a boil and cook 5 minutes. Season lightly with salt, then stir in the cabbage and let simmer for 5 minutes. Pour the hot water into the pot and bring to a boil. Adjust the heat to a gentle boil and cook 20 minutes. Drain the beans and pork and add them to the pot, tucking the pork into the vegetables so it is completely submerged. Bring the soup to a rolling boil, adjust the heat to simmering and cook, covered, until the beans are tender, about 1 ½ hours. Add the zucchini and cook until softened, about 4 minutes. Remove the pork from the soup and let stand on a cutting board. Stir the pasta into the soup and cook, stirring occasionally, until al dente–tender but firm, about 8 minutes. Taste the soup, seasoning with salt and pepper if necessary. Let rest off the heat for 5 minutes. While the soup is resting, cut the pork into ½-inch slices and tent them with aluminum foil to keep them warm. When ready to serve lay a slice of smoked pork in the bottom of each warm soup bowl and ladle the soup over it. Sprinkle with grated cheese and serve.